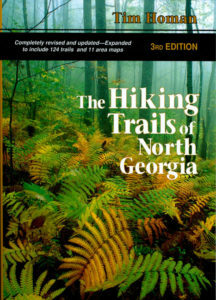 The Hiking Trails of North Georgia, 3rd Edition – Peachtree Publishing Company Inc.
A detailed, illustrated guidebook for novice and experienced hikers to hiking the scenic trails of north Georgia. Suitable for the novice and the experienced hiker alike, this comprehensive guide to the North Georgia mountains has been revised and significantly expanded, adding 23 new trails and eleven area maps. Now arranged geographically and even more user-friendly, it features 124 hikes. The Hiking Trails of North Georgia is an indispensable resource, whether you’re planning a leisurely afternoon walk or a strenuous backpacking trip. The convenient new format of the updated third edition will enable you to explore North Georgia’s beautiful natural areas with intelligence and ease. Tim Homan is an experienced hiker and outdoor writer and the author of numerous hiking guides. He lives in Georgia.